Aiesha Redmond has a commitment to equal justice for all people under the law. 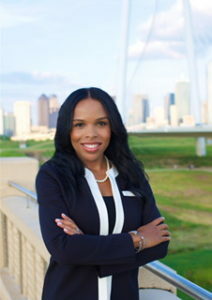 She has served as an Assistant District Attorney with the Dallas County District Attorney’s Office in the Civil and Criminal Division, where she represented the State of Texas and the citizens of Dallas County. Aiesha has handled a variety of civil lawsuits, claims, and civil matters including personal injury, employment matters and contract disputes. Aiesha began her legal career as a Litigation Attorney in the Complex Commercial Litigation Division at one of the top law firms in the country, Baker Botts, L.L.P. While at Baker Botts, Aiesha gained in-depth experience handling commercial litigation, representing corporations, individuals and governmental entities in federal and state court. Aiesha worked on a variety of complex civil matters including contractual issues, labor and employment and construction litigation. Aiesha earned her Bachelor of Arts degree from Southwest Texas State University. A graduate of Thurgood Marshall School of Law at Texas Southern University, Aiesha ranked 8th out of 210 students, earning her law degree with Honors. Aiesha is a dedicated public servant and her commitment to public service extends beyond the courtroom. She is a member of the Dallas Bar Association and has devoted hundreds of hours to the Dallas Volunteer Attorney Program providing free legal service to those who are not able to afford an attorney. She’s an active member with the Texas District & County Attorneys Association and American Bar Association and has assisted and mentored students with college and law school mock trials. Aiesha is also the Chair of Women in the NAACP Committee, where she brings awareness and education pertaining to issues affecting women and children. Aiesha is a member of Delta Sigma Theta Sorority, Inc., an organization dedicated to the community. Aiesha currently resides in Desoto, Texas with her husband and two children. She’s a member of Disciple Central Community Church in Desoto, where she spearheaded and serves as a Leader of a female mentoring program.